26-Dec-2009 - Nearly 6 years after its release, StealthOS lives on! 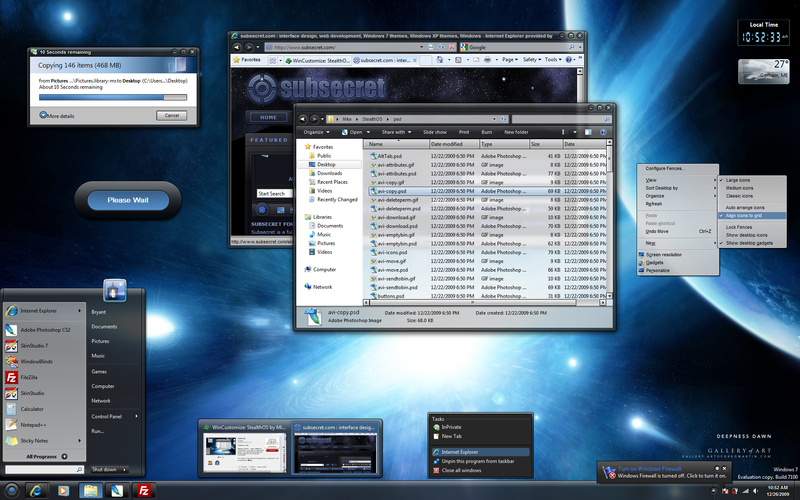 A Windows 7 substyle is now included, as well as a few minor updates. 5-Mar-2008 - StealthOS is reborn ... again. Updated for WindowBlinds 6, it now has full Windows Vista support, a new Start button and Start menu for both Vista and XP, as well as other improvements. Wow... this is the skin I have been looking for! Great work. Another great skin Mike, this is a sure contender for Most Useable, very well done! This would be a good candidate to make a whole OS suite out of. are you gonna post the userpic and wall? Wow Mike, this is so clean, classy and smoooooooth. Normally I don't go for dark skins but this one is so well balanced and usable. outstanding!!! One of my favs submitted so far. One of the nicest 'black' skins around. Love the taskbar particularly. Nice and restrained. Should be in everyone's collections of "skins I can use all day". Very nice and useable dark theme. Any chance of a thin taskbar version later? It would suite it very well. You were born to do this. You are a master. I expected the best from you, and you did not fail me, you did not fail us. Great work! Wow, this is great skin Mike, very useable, clean, and for being a dark skin, it has just enough color to make it an everyday skin. Great work! If anyone knows where to get the wall, please do share it with us because the skin is that the same without the wall. They go so nice together. Maybe your best skin yet, Mike. And that's sayin' something. This is really tight. There are some ObjectBar import issues, though, particularly with a double-height TaskBar. Drop me an email if you'd like the particulars. Thanks for an awesome skin.